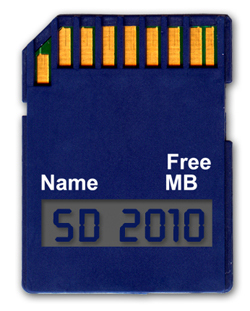 Debuting at CES 2007 in early January is the world's first SD card that comes loaded with bi-stable display technology. Bi-stable is a fancy way of saying the SD card has a very small display integrated into the card that does not require additional power sources to function. The display will show the available space on the card and name of the card. With so many gadgets using SD, it is hard to juggle them all. The Info SD won the innovations award for computer accessories at CES 2007. The Info SD is a big step forward for memory cards, but I think I know a better step. Here is my million dollar idea: find a way to add a mini-USB port onto the actual card. No need for card readers or any of that jazz, just plug the card directly into your computer. Anybody want to tackle this? I'll give you a cut of the profits.